Johnson, 25, and Graham, 27, were team-mates at Middlesbrough before going their separate ways, but were reunited by the forward's north east return. "The ball always seems to fall to him in the box, he's always there," Johnson told BBC Newcastle. "He knows where the ball will go, and I hope they will start going in for him." 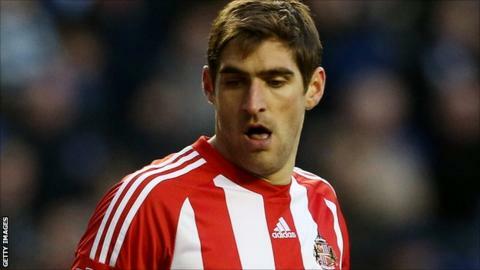 In their three seasons together at the Riverside Stadium, Adam Johnson and Danny Graham only featured in the first team at the same time on four occasions. Graham joined Carlisle from Boro and scored 40 goals for the Cumbrians in 113 games before moving to Watford in July 2009. He scored 41 in 98 matches for the Hornets, and his form with the Swans yielded 21 in 62 fixtures. Meanwhile Steven Fletcher, a striker signed to bolster the Wearsiders' attack in the summer, has been pivotal so far this season with 10 league goals - more than one third of the overall tally of 28. The onus has been on Johnson, James McClean and Stephane Sessegnon to forge partnerships with the former Wolves man in attack, something that Graham will also be expected to contribute towards. "It's knowing where each other is going to go, it's that learning curve at the minute," Johnson said. "It takes time, like a lot of things when new players come in and things, but it's about realising the situation. "We need to do things without thinking or telling someone, which is something that happens and hopefully that is going to come."